The little dwarves from the Mirror Mirror session at Agile 2008 were quite a hit with everybody we met. Now you too can play with Snow White, the Hunter, the dwarves and… the Evil Queen! This is a mini-adventure of self-discovery to improve personal effectiveness. Here’s your chance to improve the way you communicate by developing a better understanding of others and of yourself. The mirror will show you your real ability in working with others. Once you and your colleagues know more about yourselves, you can use the game to create teams where everybody plays to their strengths and help one another address each other’s weaknesses. 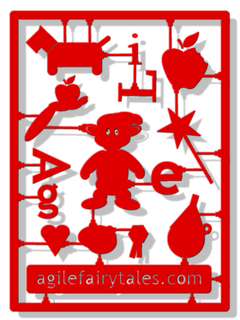 You can download the materials and session description from the Agile Fairytales Game site. The Mirror Mirror game is licensed under a Creative Commons Attribution-Share Alike 2.0 License by Portia Tung and Pascal Van Cauwenberghe. The Snow White game is the second in the Agile Fairytales series. 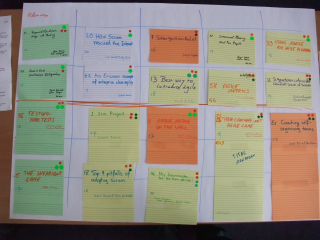 The first agile fairytale is “The Yellow Brick Road: Agile Adoption Through Peer Coaching”, based on the adventures of Dorothy in Oz. This game will published on the site soon. We’re working on more fairytales. You can find more games at the Agile Coach site. The last slot of the conference was filled with re-runs of the most popular sessions. Portia and I were interested in two sessions, but neither presenter turned up at their re-run. While we were waiting for presenters who never showed up, we played the “Mirror, Mirror” game with a few Crispies. A lot of people at the conference were interested in the games Vera, Portia and I designed. 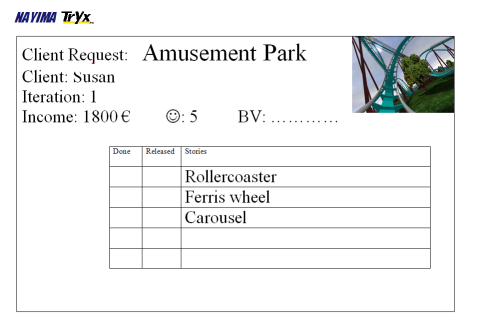 Watch out for more games on the Belgian XP users site, the Agile Coach site and the Agile Fairytales site. 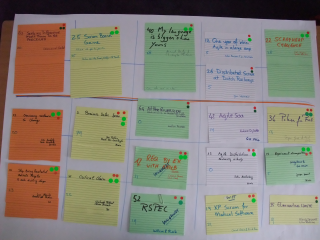 Then we realized that “The Agile Playground – Learning Games for the Agile Practitioner” was also re-run. We really wanted to go to this session to learn more about learning game building, but it was scheduled at the same time as Mirror Mirror. We ran to the session, where Don McGreal and Michael McCullough graciously allowed us to join the session midway. We took part in one game and learned some lessons about game development. Don and Michael have a whole set of games at the Tasty Cupcakes site. We exchanged games with the presenters and participants. Like Vera, Portia and I, Don and Michael provide their games free of charge as a way to give something back to the community. And then Agile 2008 was over. We talked to a few of the other participants before they left and then went for a walk to the harbourfront to get some sun and fresh air. The evening ended with a fun experiment in simultaneous blogging: Portia and I brainstormed the highlights of our Agile 2008 visit; then we had one minute to write one sentence about each topic in turn. You can see the results here and here. Saturday started with a long run along the lakeshore, followed by a walk to Kensington Market, Little Italy and Chinatown with Laurent Bossavit. The beautiful weather was replaced by rain. When we wanted to go on to the harbourfront, a heavy thunderstorm stopped us in our tracks. When the weather let up a bit, we went back to the hotel to leave for the airport. On the way, we joined the stream of people coming out of the Rogers stadium after the Blue Jays‘ defeat at the hands of the Cleveland Indians. And then we’re on our way home.